Congratulations to Janet Adamana, who is believed to be the first CreComm student to ever publish a book on the Amazon Kindle - because she is! 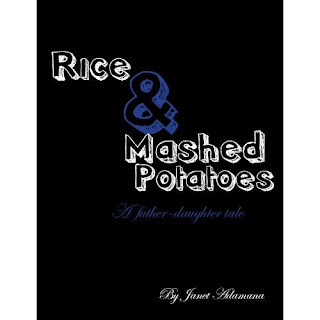 The Kindle edition of her book, Rice & Mashed Potatoes, is available for download on Amazon.com for the low, low price of $3.99. Janet's book is about a quirky, 72-year-old Filipino farmer, who renovates his house with his 20-year-old accident-prone daughter. "A humorous and heartfelt true-life story about the obstacles in life, the relationships we often take for granted and the things we ultimately learn about ourselves when we pay attention to the ones we love." Janet will be on CBC Radio One, 89.3 FM, 990 AM, at 6:45 a.m. Monday, March 29 to talk about her book. Cool, might just have to buy. How do you like the Kindle Kenton? I love mine! Kenton, I was thinking about this the other day: do you foresee having students put their novellas/novels on the Kindle and the iPad as future requirements of creative IPP projects? I think this is really cool, and am happy for Janet.